My bridal hat collection is coming along well. In fact I have far too many ideas of things I want to try and designs I want to make, than time or energy to fit them all in at the moment. I'm currently taking part in a medial study at Papworth, which is very interesting but rather time (and blood!) consuming. They are investigating if a pwcf's appetite can be increased by supplementing our production of ghrelin -the hormone that controls appetite. Annoyingly pwcf do not produce as much ghrelin as they should, so although we need to eat loads to maintain our weight we hardly ever feel hungry. Forcing yourself to maintain a high calorie diet when you just don't feel like eating is not a lot of fun, so anything that will make me actually feel hungry for a change is good in my book! I already tried to do the five week programme in April, but i got ill half way through so had to stop to have iv drugs. This time I had a total nightmare with my port. It stopped working half way through a blood test and then had to be re accessed twice more to finally manage to get it working again and hep locked properly-sigh. Am now very sore from having three needles shoved in the one place and did not get to start the second part of the trial. Oh well... back to the hats. This one is a rather fun button hat covered in pleated silk crepe to resemble a shell. It is finished with a huge silk and tulle flower. I love the flower it's just so big and bold whilst still being quite elegant. These photos are sadly not very good as, (A) the photos are by me and I am not that good at it! (B) when photographing something that is basically the same colour all over it is really difficult to get the detail to be clear and (C) the light really was not good enough for photos, but I wanted to get some pictures of it up before I go on a little holiday so won't be able to post... When we're back I will get Mr EB to take some much better ones! I was at Papworth for my annual review recently and I saw the new social worker. He is a very nice chap and we got chatting about what I do outside of CF! I was sitting making some more ribbon roses for anther hat I have in mind, so it was a pretty obvious topic but I've often been asked how I got into hat making and it got me thinking. It certainly was not planned in detail from a young age. I've always loved making things ever since I was a small child. At primary school I was always volunteering to make things for plays or projects- often to the teachers dread! I don't think as a youngster my actual skills anywhere near matched the crazy ideas that were in my head but I was incredibly keen... I loved the way you could change things like fabric and paper into totally new objects and shapes, how they became something new. I've also always loved sewing and making things from fabric and sequins and anything shiny- definite magpie complex that is still with me. My mum often made me clothes and her mum made practically all her clothes for years. In fact, I wore some of the evening gowns that Nanna made for my Mum at May Balls when I was at Cambridge, luckily for me we were the same size when each of us was aged twenty. I also get my hoarding gene from both these ladies, my Nan especially would keep tiny off cuts of fabric for donkeys years just in case she ever needed them! When she had to move into a residential home Mum and I found bags and bags of offcuts from clothes she made for my mum when Mum was a young woman. Yes, that's me on the right! 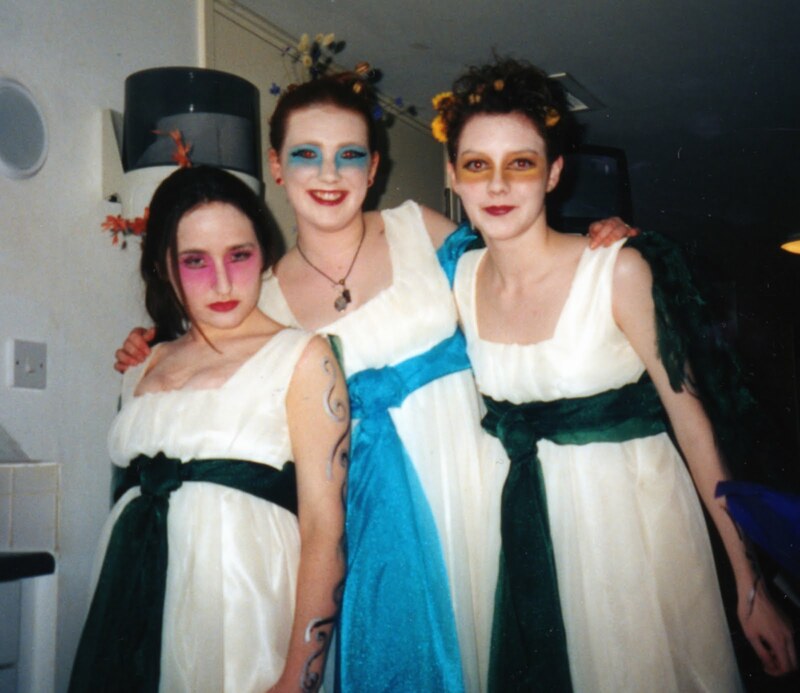 ﻿﻿﻿﻿﻿My love of sewing and glitz made costumes an obvious choice during my uni days. I had tried being on stage and actually was in the chorus as a fairy for a production of Iolanthe at Cambridge Arts Theatre- which was fantastic fun, but incredibly knackering. I did not have the lungs to manage that much singing, but I loved the theatre and still wanted to be involved. I volunteered to do the costumes for a production of the Mikado at the Minack theatre in Cornwall and have never looked back. 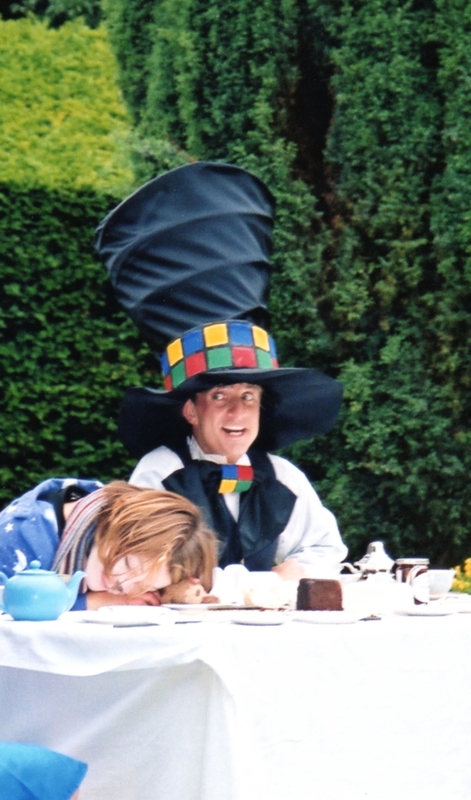 I did quite a few hats during the various productions I was involved with, including a two foot tall twisted top hat for the Mad Hatter in Alice in Wonderland. Me, in my Ladieswear Project. 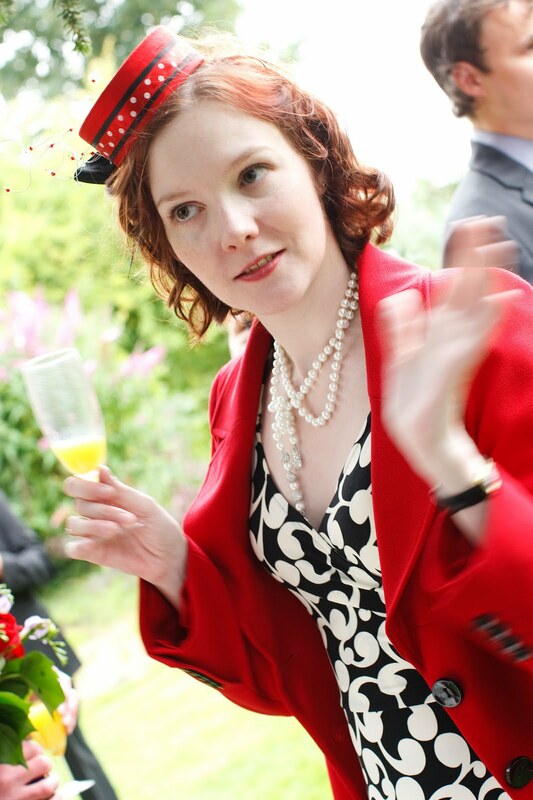 The first hat I made to wear to a wedding. As I got more daring and experimental with the wire and buckram creations I bought more and more books about hats, and downloaded everything I could find to feed my hatting addiction It soon became clear that I needed to give blocking a go. I'd always been a bit put off from this technique of hat making, because hat blocks are expensive things and I did not want to shell out £100 or more to find I was not going to get any use out of the block. Thankfully, I found the marvellous block makers Guy Morse Brown, who do an introductory block, pins and book set for a very reasonable price so I decided to try it out. On receiving the block my inner hatter was ecstatic to find that not only was blocking something that I could learn (with a bit of practice and swearing) but that hat blocks really are gorgeous tactile objects in themselves. So when my friends asked what I wanted for my 30th birthday I asked for another hat block and bless them, they bought me five mini fascinators blocks that are just fabulous. Now I must admit to being rather obsessed with hats, I can't help it! Not only is making them incredible fun and interesting, but the finished product is so beautiful (I hope!) and gives such pleasure to the people I make for -I just wish I had discovered this wonderful art earlier and that my Nanna could have seen some of the things I've made, I like to think she would have been proud of me.